PITTSBURGH—A self-driving car developed by Carnegie Mellon University today demonstrated that it could negotiate congestion and highway traffic while safely changing lanes and merging during a challenging 33-mile drive from Cranberry, Pa., to Pittsburgh International Airport. This uniquely capable vehicle nevertheless looks, from the outside, much like any other 2011 Cadillac SRX. U.S. Rep. Bill Shuster (R-Pa), chairman of the House Transportation and Infrastructure Committee, and Barry Schoch, secretary of the Pennsylvania Department of Transportation, were along for the ride in the autonomous car. A human was in the driver's seat as a safety precaution, but all of the driving was done by Carnegie Mellon's innovative software, relying on inputs from radars, lidars and infrared cameras. "We are extremely honored that Chairman Shuster and Secretary Schoch wanted to be part of this event today," said Raj Rajkumar, who directs CMU's U.S. Department of Transportation-funded transportation research center and co-directs the CMU-General Motors Autonomous Driving Collaborative Research Lab. "We are fortunate to have government leaders with passion and vision for the potential of technology to transform U.S. transportation," he added. "The technology and infrastructure necessary for making transportation safer and keeping our nation globally competitive in the growing market for autonomous driving doesn't come easily or cheaply. Much work remains to be done on both the technological and policy fronts. "Autonomous driving technology is progressing rapidly," Rajkumar continued, noting that many auto makers and companies such as Google host active research efforts. "This car is the holy grail of autonomous driving because it can do it all — from changing lanes on highways, driving in congested suburban traffic and navigating traffic lights. This car and the research team behind it are proof that Carnegie Mellon continues to be a leader on this emerging frontier." Unlike some previous self-driving vehicles, including Boss, the autonomous Chevy Tahoe with which CMU won the 2007 DARPA Urban Challenge, the SRX doesn't bristle with exotic and expensive sensors. The vehicle uses only automotive-grade radars and lidars, which are unobtrusively embedded around the car. Its computers are hidden under the cargo floor. In addition to controlling the steering, speed and braking, the autonomous systems also detect and avoid obstacles in the road, including traffic cones and barrels, as well as pedestrians and bicyclists, pausing until they are safely out of the way. The systems provide audible warnings of obstacles and communicate vehicle status to its passengers using a human-like voice. 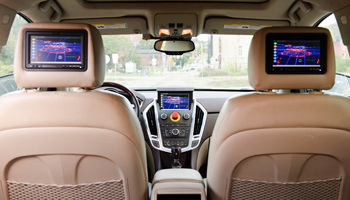 This Cadillac SRX also can communicate with instrumented traffic lights and other vehicles equipped with wireless communication devices to enable cooperation. The main goal of CMU's driverless car is to reduce accidents, thereby decreasing injuries and fatalities. In addition, autonomous vehicles will save time during daily commutes and long distance travels by taking over the task of driving and giving people more time to catch up on rest, work and family time, according to Rajkumar. "The car's electronics are simply more reliable than people and will protect drivers from their own bad behavior as well as those of others, such as drinking or texting," Rajkumar said. More than 40,000 Americans lose their lives each year in traffic accidents. Rajkumar suggests that self-driving vehicles will begin to be commercially available around 2020 as near-term costs as well as social and legal concerns are addressed. In the meantime, however, these technologies can be incorporated gradually, allowing drivers to adapt while adding safety and convenience. Rajkumar said adaptive cruise control and lane departure warnings, already available in some cars, are examples. The next step could be on-demand autonomy, where the car takes complete control under specific scenarios, such as low-speed driving in bumper-to-bumper traffic or driving on single lane highways. 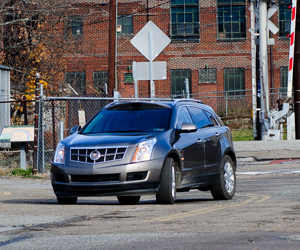 The self-driving Cadillac SRX builds on a long tradition of autonomous navigation research at Carnegie Mellon. General Motors has been a sponsor of the award-winning Boss team and continues to support autonomous driving research at CMU. Sensor fusion, which enables adaptive cruise control, collision alerts and other advanced safety features in the 2013 Cadillac XTS, was created in part from GM's experience with Boss. CMU's portfolio of transportation technology projects includes the Traffic21 initiative, launched with the support of the Hillman Foundation and the Technologies for Safe and Efficient Transportation Center, a U.S. Department of Transportation University Transportation Center at Carnegie Mellon in partnership with the University of Pennsylvania that also received support from the Hillman Foundation. This uniquely capable vehicle looks, from the outside (top photo), much like any other 2011 Cadillac SRX. The lower image shows the navigation system monitors in the dash and front seat headrests.